Ah, the joys of MS Paint. And no, I don’t have Photoshop – I’m cheap. When we came home from vacation, we didn’t realize that we were dealing with an invasion. While not aliens, these creatures were just as strange. At first, we assumed that our zucchini plants had died because they were overwatered, grew too large, fell over and unrooted themselves. That may have been a contributing factor to the zucchinis’ deaths, but we knew it couldn’t be the cause when the butternut squash – which spreads outward rather than upward – started looking emaciated. Many of its leaves faded, turned brown, and finally completely wilted. Unfortunately, squash bugs are pretty nasty. Even though the agricultural outreach website said butternut squash is one of the more resistant varieties, just one look at my plant would show that it was far from immune. The bugs certainly look ready to go into battle, with their armor-looking exoskeletons. Being short on time as usual, I tried the easiest method first. The University of Minnesota’s extension site said that the bugs find shelter under plant debris and rocks. While it recommended removing the offending debris, the natural messiness of lasagna gardening wouldn’t allow for that. However, it also said that if you placed a board next to the plant, all of the bugs would retreat under it at night. 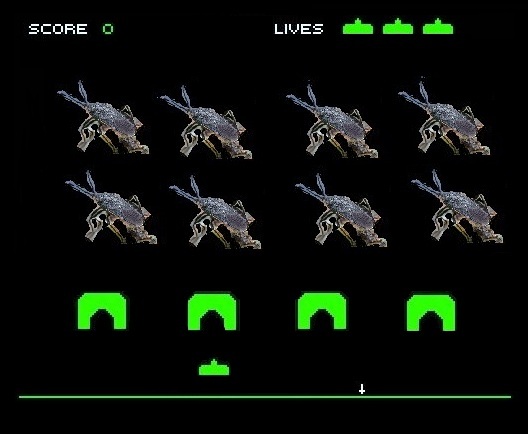 Then you could flip the board over and kill them in the morning. Unfortunately, we had approximately zero luck with this method. There wasn’t a single bug left when we flipped the boards over. I’m not sure if they had too many other options for shelter or they just got up earlier than we did. My next opportunity for getting advice was at the Montgomery County Agricultural Fair. I enjoy hanging out in the Master Gardeners’ exhibit in hopes of gaining knowledge by osmosis or being a know-it-all (bad habit, I know). But this time I had a legitimate question. Fortunately, the volunteer I asked had dealt with these critters before. She recommended picking them off by hand and drowning them in soapy water. 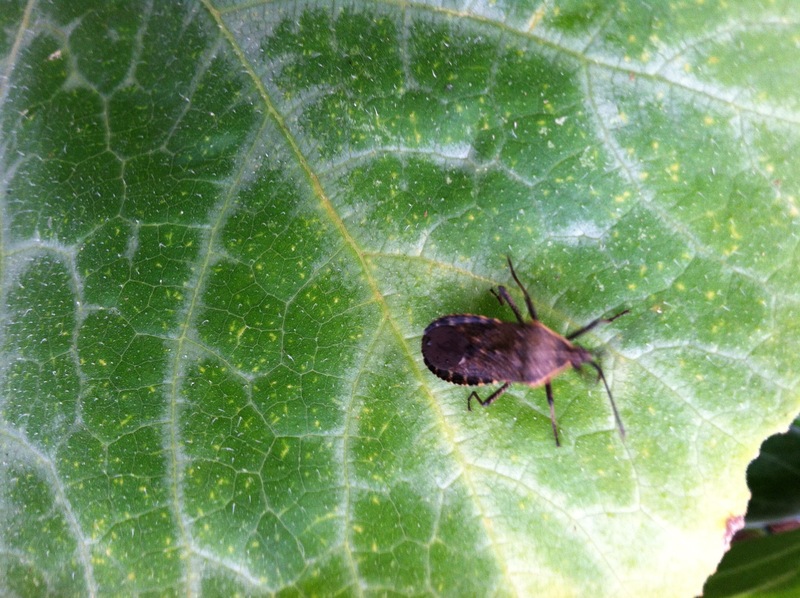 So we spent the next few days on squash bug patrol. We kept a bucket of soapy water in the garden and every time we walked by, searched the leaves for bugs and dropped a few more in. It was pretty gross by the end. We were good for a couple of weeks before the next generation of squash bugs hatched. Unfortunately, the leaves are starting to shrivel again. The bugs are a little harder to find this time, so maybe they’re getting more careful. Although there’s no way to “win” once and for all, just like the video game, I’m still going to keep trying. I am determined to eat my hard-earned butternut squash this fall. Update: Just a few days after this entry, we realized that the squash bugs had won. Unlike the easy-to-spot adults, the juveniles don’t hang out on the full leaves. Instead, they hide in the flowers and under the prickly stalks where I wasn’t looking. The plant that our singular squash came from is totally shriveled. Chris suggested that we don’t plant squash next year just in case the bugs stick around, which is probably a good idea. This entry was posted in food, gardening and tagged butternut squash, food, gardening, permaculture, squash bugs, zucchini. Bookmark the permalink.